Liver injuries represent 5 percent of all trauma patients. It is frequently injured in both blunt and penetrating trauma. The liver is divided into two lobes that extend from the gallbladder to the left side of the inferior vena cava in the back center of the abdomen. The liver gets its blood supply from the large hepatic artery. It branches off from the celiac artery, which provides about half of the oxygenation of the liver. The hepatic veins have different branches that come together to drain the deoxygenated blood from the liver. The left hepatic vein drains into the inferior vena cava, which goes directly to the heart to reoxygenate the blood in the lungs. The portal vein comes up from beneath the liver and provides the other half of the liver’s oxygen. There are several ligaments which attach the liver to the abdomen and diaphragm. The coronary ligaments attach the diaphragm to the liver and the falciform ligament attach the liver to the abdominal cavity. Because the liver is the largest solid organ in the body, it isn’t surprising that it is injured so often. Motor vehicle accidents represent the largest number of blunt liver injuries followed by pedestrian injuries, falls, assaults, and motorcycle accidents. Airway, breathing, and circulation take precedence over the actual liver injury. The liver, however, can be hemorrhaging, resulting in problems with circulation. A physical examination of the area of the liver can be misleading. Up to 43 percent of the time, a benign abdominal examination was noted in the presence of a large liver bleed. Ultrasound is a good way to evaluate the presence of a liver injury and this can be done at the bedside. It is important to keep the patient warm because a cold patient can develop problems with blood coagulation, which can make the situation worse. The two most important ways to evaluate a patient for a liver injury include the FAST examination (focused abdominal sonography for trauma) and the peritoneal lavage. In the peritoneal lavage, an incision is made and fluid is instilled into the abdominal space. After a while, the fluid is drained back out. If it is significantly bloody, there is probably a laceration of some kind of abdominal organ. In most institutions, the FAST examination has replaced the peritoneal lavage because it can better tell the source of the bleeding. It is about 98 percent sensitive in determining a high grade liver injury. The exact location of the liver bleed was not able to be identified with the FAST exam, however. Fluid, if bleeding is present because of the liver, tends to accumulate in the right upper quadrant of the abdomen and in the lower recesses of the abdomen. CT scanning has vastly changed the management of liver injuries. CT scan can be done of the head down to the pelvis in less than ten minutes. Trauma surgeons now use these types of scans to detect trauma from most of the body. CT scanning can also be done in penetrating trauma to the liver. Laparoscopy is a camera study of the abdomen. It is done using small incisions placed in the abdominal wall. It can tell if there is a rupture of the liver and can identify the source in many cases. If the patient is hemodynamically stable with a normal pulse and blood pressure, the liver injury can be managed without surgery. Most liver injuries are venous, meaning they are low pressure injuries. The hemorrhage usually stops and forms a clot around the liver. In fact, about 85 percent of all blunt liver trauma patients are stable. If the patient remains stable, nothing further needs to be done. High grade injuries with large amounts of blood in the abdominal cavity don’t necessarily need surgery but they have a higher chance of failing non-operative management. In fact, some surgeons have taken these patients to the operating room only to disrupt the venous system even further, resulting in the death of the patient. If arterial bleeding is found to occur, the artery can sometimes be clotted off using a technique that involves putting a blood clot in the artery through an angiogram. Most non-operative liver injuries heal without problems and no evidence of blood clot or other injury is seen on CT scan after 4 months. Complications can, however, arise. These include infection, ongoing bleeding, and problems with the bile duct system. Bile leakage can be a problem with non-operatively treated liver injuries. It occurs 3-20 percent of the time. Drainage of the bile leak through the skin has been found to help in many cases. If large bile leaks occur, the sphincter that drains bile from the biliary tract to the duodenum can be opened up so that the pressure inside the biliary tract is less and leakage slows so the system can heal. Abscess/infection in the blood clot. Even minor injuries/lacerations to the liver can be identified upon opening up the patient’s abdomen so that the laceration can be visualized and sutured. A simple midline incision exposes most of the liver so lacerations can be found and treated. Minor, nonbleeding wounds should not be probed because this can start the bleeding back up. Cautery can control very minor lacerations of the liver. Packing a piece of the fatty tissue (the omentum) of the abdomen into the lacerated area can stanch the flow of blood and can heal the affected area. Gelatin sponges can also be placed over minor lacerations to control bleeding. In major liver injuries, these patients may need to be taken directly to the operating room for treatment. A midline incision is used. Usually, there is a large amount of blood in the abdomen, which has to be evacuated. Manual compression will usually stop this sort of bleeding. Fluids must be given warmed, along with coagulation factors and platelets to control bleeding. The liver can be packed to slow the bleeding. This involves damage control and the person may need a second operation to definitively repair the liver damage. There can be a problem in further bleeding upon attempting to remove the packs. The packs can be wetted so that they slide off the liver more easily. Plastic can be used between the liver and the packs in order to keep the packs from sticking to the liver surface. Sepsis can be a complication of prolonged packing of the liver. Deep liver injuries can be sutured together with large sutures. The problem with this technique is that it can lead to bile duct injury. Filling the defect with fatty omental tissue has also been found to be helpful. The omentum is suture to the liver to control bleeding and stop infection. Packing with omentum also works with deep penetrating injuries to the liver. Sometimes a Foley catheter is placed inside the cleft and the balloon is blown up with saline. The catheter is left in place for 24-48 hours and is removed at the time of a second surgery. There are also sealants made from fibrin that can glue the liver fractures together. This is a new procedure, not yet out in everyday practice. Resection of the liver can be done to remove the bleeding part of the liver but this has a relatively high mortality rate. One technique involves clamping the injured liver segment and then waiting for it to die off, removing it after a couple of days. In rare cases, a hepatic transplant may need to be performed. The patient must otherwise have a good chance of survival and a donor liver must be available. Complications of operative treatment of liver injuries include bleeding, disruption of the biliary tract, bile in the bloodstream, death of liver tissue, and fistula of the liver. These are fortunately very rare injuries, necessitating repair of very small ducts. Many are a result of blunt trauma to the abdomen. Gallbladder injuries make up 66 percent of non-liver injuries to the biliary tract. Blunt injury results in tearing off of the gallbladder from beneath the liver. Most of these injuries are associated with other injuries to the abdomen. 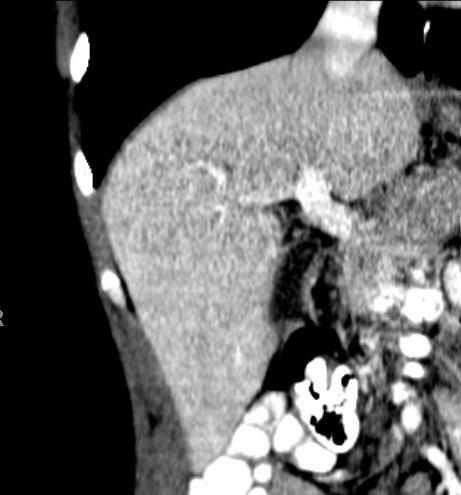 Gallbladder injuries can be found on CT scan of the abdomen. Patients can have peritonitis from bile in the abdominal cavity and pain in the right upper quadrant. Ultrasound may also help make the diagnosis of gallbladder injury. Isolated gallbladder injuries are treated by removing the gallbladder. It is usually done with an open procedure but laparoscopic removal of the bladder has also been done. Bile duct injuries need placement of drains in the ducts until they can be repaired formally in surgery. Stable patients can have the bile duct repaired in the initial surgery. Patients with large parts of the ducts missing are hard to treat but there can be connection of the remaining bile duct to the duodenum, bypassing the injured areas of the duct.